L-R: Senior Vice Provost Duane Larick, Jason King, Helen Armstrong, Muntazar Monsur, Arthur Earnest, Nilda Cosco, Robin Moore, Jakia Salam. Photo by Marc Hall. 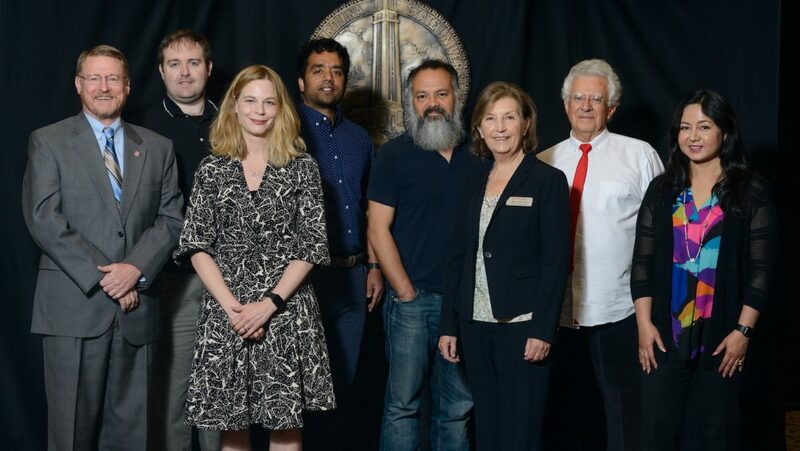 DELTA congratulates Research Associate Professor Nilda Cosco, Ph.D.’s Landscape Architecture Environment and Behavior (LAR E&B) team and Teaching Assistant Professor Jason King, Ph.D., as recipients of the 2018 Gertrude Cox Award for Innovative Excellence in Teaching and Learning with Technology. 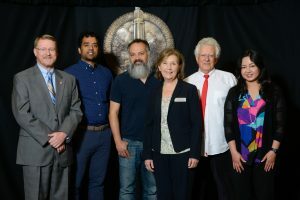 Cosco and King received their awards at NC State’s Teaching Awards Ceremony on Wednesday, April 4 at the McKimmon Center. Cosco’s team, made up of NC State faculty and DELTA staff, was awarded in the innovative tool category for their DELTA Exploratory grant work on an interactive Map Tool. This tool allows landscape architecture students to explore landscapes in 360° videos and identify concepts of behavior in different environments. Student can also switch between interactive 2-D maps. 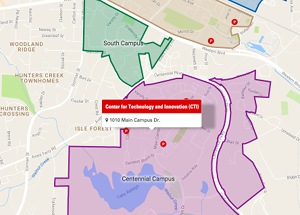 The map tool was used as part of two courses and two certificate programs. King was awarded for the redesign of computer science course CSC 316 (Data Structures). King was assisted by a team of DELTA staff members as part of a DELTA Critical Path Course Redesign Grant project which began in 2016 and is being continued for the 2017-2018 grant cycle. The goal of this course redesign project is to improve student engagement, guide critical thinking, and help students incorporate data structure and algorithm theory into real-world programming projects. L-R: Senior Vice Provost Duane Larick, Muntazar Monsur, Arthur Earnest, Nilda Cosco, Robin Moore, Jakia Salam. Photo by Marc Hall. 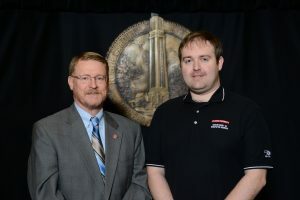 L-R: Senior Vice Provost Duane Larick, Jason King. Photo by Marc Hall.